– Communities affected by the mining project report that the company has omitted information from investors and Mexican authorities about its plans to extract gold and silver. – An Impact Assessment on Human Rights found that the company’s activity endangers the environment and the rights of the inhabitants of the area. 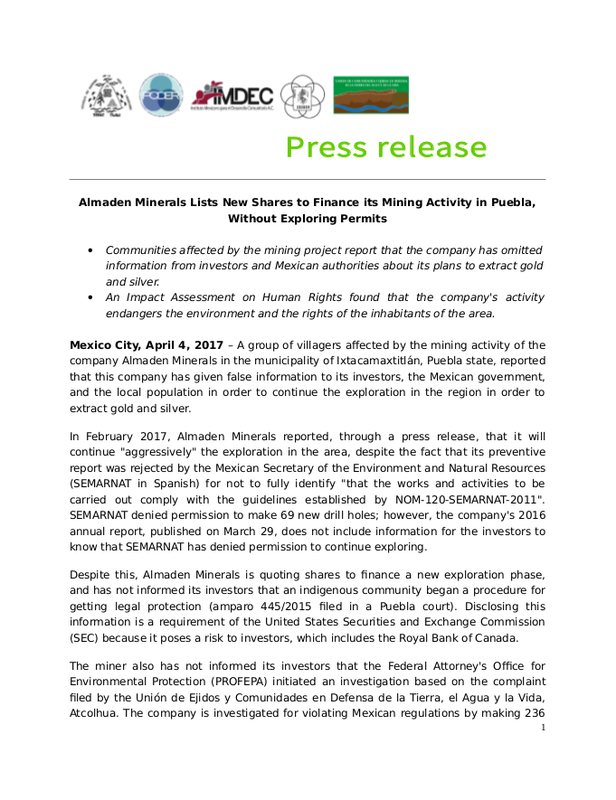 Mexico City, April 4, 2017– A group of villagers affected by the mining activity of the company Almaden Minerals in the municipality of Ixtacamaxtitlán, Puebla state, reported that this company has given false information to its investors, the Mexican government, and the local population in order to continue the exploration in the region in order to extract gold and silver. In February 2017, Almaden Minerals reported, through a press release, that it will continue “aggressively” the exploration in the area, despite the fact that its preventive report was rejected by the Mexican Secretary of the Environment and Natural Resources (SEMARNAT in Spanish) for not to fully identify “that the works and activities to be carried out comply with the guidelines established by NOM-120-SEMARNAT-2011”. SEMARNAT denied permission to make 69 new drill holes; however, the company’s 2016 annual report, published on March 29, does not include information for the investors to know that SEMARNAT has denied permission to continue exploring. Despite this, Almaden Minerals is quoting shares to finance a new exploration phase, and has not informed its investors that an indigenous community began a procedure for getting legal protection (amparo 445/2015 filed in a Puebla court). Disclosing this information is a requirement of the United States Securities and Exchange Commission (SEC) because it poses a risk to investors, which includes the Royal Bank of Canada. The miner also has not informed its investors that the Federal Attorney’s Office for Environmental Protection (PROFEPA) initiated an investigation based on the complaint filed by the Unión de Ejidos y Comunidades en Defensa de la Tierra, el Agua y la Vida, Atcolhua. The company is investigated for violating Mexican regulations by making 236 more drill holes than those authorized, with greater depth, and at risk of having drilled the aquifer, according to information generated by the same company, which was not shared with the Mexican authorities nor with the inhabitants of the area. Accompanied by the civil organizations Center for Studies for Rural Development (CESDER), Mexican Institute for Community Development (IMDEC), Project on Organization, Development, Education and Research (PODER), and the Union of Ejidos, the inhabitants of Ixtacamaxtitlán Indicated that the company has not communicated the scope of its project to the affected communities nor has it informed them of their intention to exploit a common good, and has reserved information on the risks involved in this project for the environment, water and health. The Ixtacamaxtitlán Water Committee reported that the company has sought to misinform the population by saying that the cyanide used in the leaching process does not contaminate water. In addition, the company fosters clientelistic relations with the villagers by granting economic support for the patron saint festivities in exchange for the support of their project from an entire community. The villagers and civil organizations presented a Human Rights Impact Assessment which they carried out with the support of experts in geochemistry, biology and health. This assessment concludes that the presence of Almaden Minerals in Ixtacamaxtitlán puts at risk the human rights to water, a healthy environment and the health of the population, and increases competition for water and land. Those affected urged SEMARNAT not to grant more permits to the company; and PROFEPA to punish the company for the documented irregularities.